Peripherally inserted central catheters (PICCs) have become an increasingly popular alternative to traditional percutaneous central venous lines. They require little or no sedation, can be placed at the bedside using minimal equipment, can be maintained at home, and, in the right patient population, offer lower rates of infection and other complications than traditional percutaneous central lines. 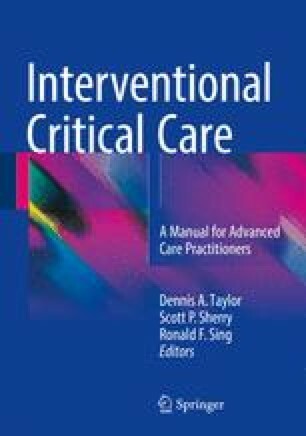 This chapter details a method for selecting appropriate patients, determining the risks and benefits of a PICC for a given patient, and preparing for, placing, and evaluating complications of a PICC. Ultrasound guidance, the modified Seldinger technique, and direct cannulation are described.